The NAPO® Annual Conference & Organizing Expo™ is the best opportunity for Organizing and Productivity Professionals to immerse themselves in NAPO education and culture. Whether you are a newcomer to the profession or have years of experience, the Annual Conference has something worthwhile for you. Attendees can customize their conference experience by choosing from dozens of informative breakout sessions. You’ll have the opportunity to connect, learn, and share experiences with colleagues from around the world. The Organizing Expo features the latest organizing products and related services. The Expo provides access to company representatives from a wide range of manufacturers, retailers, and industry service providers. The Conference is held every spring in locations throughout the United States. Recent conferences have taken place in Los Angeles, Phoenix, New Orleans, Baltimore, San Diego, and Columbus. See our list of NAPO Affiliate Partners for their conference information. Members of the National Association of Professional Organizers, Greater Philadelphia Chapter (NAPO-GPC) Jen Bowen, Sue Frost, Karen Jessee, and Carla Shipman and NAPO National member Pat DePalma joined forces for the 3rd annual “Project Thanks” one day make-over. The recipient family was selected from a lottery-style drawing which was open to all military service men and women, including veterans, at Dover Air Force Base last summer. The recipients, Technical Sergeant Jason Wicklund and his wife Valerie, received their home make-over on November 13, 2015. With Jason home on leave and Valerie squeezing us in between attending classes for her Master’s degree and caring for their four beautiful children, we sat down to carefully craft a personalized plan. Next, it was carried out like a military operation – if we do say so ourselves. The boys room was organized to meet their growing needs. Valerie’s master closet was purged and sorted. Their daughter’s room and closet was organized to suit her needs (and the very feminine preferences of the only girl). Lastly, the children’s craft area was sorted to simplify putting things away, and to keep track of inventory at a glance. The organizers enjoyed every moment of this opportunity to help the Wicklunds and honor our military community. It may be a small gesture, but NAPO-GPC’s work with our military community is always done with heartfelt appreciation. When Jackie Dawson entered the drawing at the Kids/Teachers/Educators Understanding Deployment Operations (TUDOS & KUDOS) at Dover Air Force Base, little did she know that her family would be the recipient of the Project Thanks: One-Day Organizing Home Makeover 2016! Jackie and her husband, Senior Airman Christopher Dawson, welcomed members of the National Association of Professional Organizers, Greater Philadelphia Chapter (NAPO-GPC) on Veterans Day, November 11, 2016, into their home. NAPO-GPC members Carla Shipman, Sue Frost, Yasmin Goodman, Angela Ficco, Martha Spittal and Denise MacMurtrie felt privileged to volunteer their time and express their gratitude to this representative military family. The day could have been entitled “Operation Closets” as the team organized four closets including the master, hall and two bedroom closets. All four of the Dawson children were eager to assist. When the three older children realized why this mysterious team of ladies was there, they squealed with delight, “I can’t believe we won!” Even their one-year-old sister helped! SrA Dawson has served in the Air Force as C5 Crew Chief since 2013. The family just received word they will be relocating to Ramstein Air Force Base, Germany in February, 2017. They expressed gratitude that Project Thanks is their first step in preparing them for their next Air Force assignment! NAPO-GPC members Carla Shipman, Yasmin Goodman, Debbie Lillard, Darla DeMorrow and Annette Reyman were speakers at the 2016 Philly Home Show at the Pennsylvania Convention Center. Our members shared with the audience their expert knowledge on various organizing topics. Fifteen volunteers from NAPO-GPC helped out at a local children’s charity called Cradles to Crayons. We have helped out here before and always had a rewarding experience. 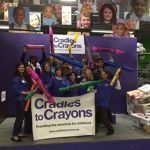 Cradles to Crayons (C2C) collects gently used clothing, toys, books and outerwear for children living in poverty in the Philadelphia area. They then work with 250 local organizations to provide care packages for individual children. C2C is run by only 12 employees and relies heavily on volunteers. Volunteers sort, quality-check donations and then shop for the children in need. Visit www.cradlestocrayons.org/philadelphia for more information on their most needed items and to find out how you can help.